Staats said of the restrictive Kahnawake membership rules, "I don't think they are doing it to be harsh, it's a very complex issue, and they are doing what they think they need to do." The Chief reported that out of 133 Six Nations marriages last year, 82 or 83 were to non-band members. Staats said that it is a natural development, especially with kids going off to universities and colleges. "I don't know that you can control that," he said. Staats said that Six Nations accepts the DIA standards to determine membership, but that the band does control who is given residency on the territory. The Chief explained that since 1986, there is a second generation rule in effect to govern Indian status. If someone who is 50% native marries a non-Native, their child will lose status. 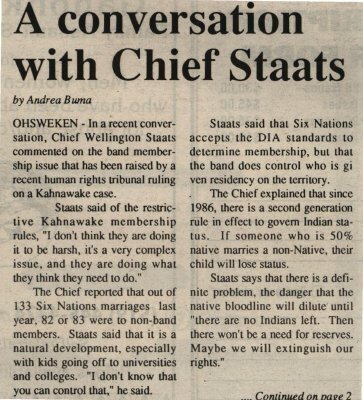 Staats says that there is a definite problem, the danger that the native bloodline will dilute' until "there are no Indians left. Then there won't be a need for reserves. Maybe we will extinguish our rights." There has been no chance to sit down and deal with the issue the last couple of years, says Staats. He explains that there would have to be a majority of 51 per cent plus one in order for Six Nations to draw up their own membership code, and "it's tough to get the majority to agree to something here. Especially with the large population." Staats says the problem can be helped by education. He says young people should be told that if they marry a non-native, there is a chance that their grandchildren will lose status. He also pointed out 'that non­-natives who marry native people are very vulnerable. The spouse can't own any property on the reserve, so if a couple divorces the non-native will have to leave the reserve, and will end up with nothing. The same thing will happen if the Native spouse passes away. The Chief said that any movement towards a membership code for Six Nations would require extensive community input, in order to properly weigh the pros and cons of the different available options. The Chief did not have much to report on recent activities, saying, "Council and administration have really been occupied with getting all the details done, because it is our fiscal year-end right now. April 1st marks the start of a brand new year." Staats said that the March 17 council meeting was cancelled because it was the same evening as the Little NHL tournament opener, and councillors needed to be there. He said that he thought that the tournament came off excellently, that the participating teams that he talked to were very enthusiastic about the success of the tournament. Staats reported that they are busy working on the Indigenous Games bid. People from the Indigenous Games committee will be visiting Six Nations and New Credit as well as sites in Hamilton and Burlington in June. Staats says that council is working closely with the cities of Brantford and Hamilton on the bid, and pointed out "I'm sure those cities benefitted from the Little NHL, with rooms in motels booked, and people going to restaurants." The Chief also pointed out that U.P.S. will be in Ohsweken this Saturday to deliver the $25,000 worth of equipment that they are donating to the Six Nations community. Six Nations Elected Band Council ; Little NHL ; Department of Indian Affairs ; UPS.